Whether you call it the French Riviera or the Cote d’Azur, France’s Mediterranean coast from Cannes to Nice and beyond has an almost mythically glamorous appeal. The beautiful people (le Beau Monde) have flocked here for generations. And if Ernest Hemingway, David Niven, Joan Collins and Elton John have all holidayed here then, frankly, who are we to argue? From private helicopter pads, the Michelin-starred restaurants, the oh-my-god-look-at-the-size-of-that yachts and the private beaches, to those of you who drive our own cars, shop for our own food and maybe have to share a swimming pool with more than just our nearest and dearest? Here are a few suggestions. If you’re self-catering (and even if you’re not), don’t go past the local markets. Every town or village has at least a weekly market and many are held daily (usually mornings only). You are guaranteed top quality produce, but it may not be too cheap. The fruit and vegetables are local and seasonal (asparagus, peaches, melons and tomatoes are all excellent). There’s also local honey, olive oil, sea food and meat. The cheese and pates are legendary. It’s the cheese that can overwhelm – France produces around 400 varieties. Most stallholders allow you to try (gouter) before you buy. A small selection usually includes a Reblochon (from the Savoie), some Époisses (from Bourgogne) and a nice soft Brie de Meaux. How about a roll of Chevre (goat’s cheese) which you slice, place under the grill until just melted and then serve with ultra-thin toast and a crisp green salad… known as salade de chevre chaud. One of the most know markets on the Riviera is Nice Flower market (Tuesday to Sundays from 7 am to 1.30 pm), and food market on the Cours Saleya. We love that market for the ambiance, the restaurants, but it’s very touristy. So, if you want to have lunch there, take the side roads, you will find plenty of restaurants that are not on the Cours Saleya, very good food and well priced ! For a real local market in Nice and a true local producers experience, you have to go to the Marche de la Liberation. From Villefranche sur mer, Eze, Beaulieu sur mer, take the train to Nice Ville train station. Than, turn left and once you hit the main boulevard, just walk up. You cannot miss it ! Every morning except Monday’s. Very few tourists, great fish, worth going ! After the hard work of buying food, it’s traditional to retire to a local café. Here you take a seat on the terrace while sipping on a café au lait or glass of wine (depending on the hour). Now, if you order a café au lait, for sure you are not a local except if it is 8 am ! Locals go for a simple expresso mornings or afternoons. You may, if you‘d like, read a local newspaper such as Nice Matin. You will observe that local couples sit side-by-side at a table rather than facing each other. This is so that both parties may watch (and comment) on passers-by. And then, of course, it’s home to eat all that lovely food. But before you go back to cook, experience the French Apero or aperitif : a drink before lunch or dinner. If you are a man, please try un pastis, and add water, and if you are a lady, try a Kir (white wine with crème de cassis), or Kir Royal made with Champagne instead of white wine. Then you can head back to your rental, or go out for dinner ! Ratatouille : made of eggplant, local zucchinis, tomatoes, onions, green and red peppers, cooked for at least 3 hours ! Pissaladiere : Please don’t call it onion tart because it is not ! onion tarts can be found in Paris but not in the Nice region! Pissaladiere is made of pizza dow with more olive oil, cooked onion, with black Nice olives and anchovies on top. A very good place to buy some is the bakery in Rue du Poilu (old town pedestrian), in Villefranche sur mer. Socca : Socca is some kind of a large crepe made of cheek pee flour. You will find a lot of people selling it in Nice old town, especially on the Cours Saleya where the flower market is, but please don’t try it there ! Even if the lady selling it,Theresa does look local. There aren’t places in the old Nice that we know of making good Socca any more ! But if you go by the Port of Nice, in a street called Rue Bonaparte, right behind the Port Church, you can try the best socca in town at La Socca d’Or (not chez PIPO on Rue Bavastro which you will find in every guide !). La Socca d’Or is only opened from 5.30 pm from Tuesday to Saturday. You can also try their pizzas and pissaladiere. With a glass of rosé for l’Apero, or for dinner. Or just take the socca and eat it while you take walk along the Port of Nice. Le pan bagnat : in the US they have the sub, or club sandwich, we have the pan bagnat : lots of bakeries are selling pan bagnat in a round bread, the best in town is found at La Piccada in Avenue de la Californie in Nice but out of the sight seeing way ! Buy a round pan bagnat bread per person at the bakery, then in a big bowl, slice in very small pieces : tomatoes, radishes, green and red peppers, lettuce, fresh basil, a can of tuna in olive oil. Add olive oil and stir. Hard boil 1 egg per person, buy some real black Nice olives at the market, olive oil, and anchovies. Open the pan bagnat bread in two, and set a layer of the lettuce, peppers etc…, slice one egg per sandwich, put on top of veggies, 2 anchovies, a couple of black olives. Close the bread with top, smash it. And let it sit of at least half an hour ! Some people add vinegar and salt before closing. The best sandwich ever ! If you’re brave, join the locals and use a motorbike or moped. If you’re not so brave, then go for a car. Whatever you’re driving, keep your wits about you. Many roads are bordered by deep ditches and drivers think nothing of overtaking with mere centimetres to spare. And it can feel like they all graduated from the Monaco F1 Grand Prix School of driving. Assuming that we haven’t put you off, a car is pretty much a necessity if you want to see the country. There are rewards: driving up a long path towards an old chateau, manoeuvring a tight bend into a valley of vineyards, taking the coastal road at sunset. Even the A8 motorway from Nice airport is scenic: on a clear day you can see both the sea and the Alps. If you prefer the water, there are plenty of boat trips. Some are sightseeing cruises (mainly from Nice or Cannes), others are the A to B transport variety. 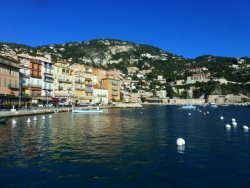 Rather than driving to St Tropez, why not take the boat across the bay from Port Grimaud or Ste Maxime? It’s a great alternative to sitting in traffic and has the bonus of keeping children entertained. Of course, there are the A-Lister beaches with private sun-loungers, designer bikinis (always accessorised with diamonds) and paparazzi lenses. But this is not all that the coastline has to offer. Whatever your kind of beach, you’ll find it here. Golden expanse of sand or rocky cove, party central or family-friendly, clothed or, um, unclothed. If walking is your thing, then take a walk along the coastal path. From Beaulieu to St Jean Cap Ferrat on the Promenade Maurice Rouvier, on the Cap Ferrat with the tour of the Cap Ferrat (about one hour) and the tour of St Hospice (about 30 mn or 1 hours if you choose to visit the Chapel St Hospice), the Nietsche Path going from Eze sur mer to Eze Village. The main reason to head to Cap d’Ail is the wonderful 3,6 km long coastal path which can comfortably be covered in an hour and stretches from the Plage Marquet (500m west of the border with Monaco at Fontvieille) to the splendid Plage de la Mala. This footpath, not to be used during days with rough seas, can easily be accessed by car or on foot from Monaco train station: most of it is pretty easy even if you’re not great hikers, apart from the last approach to the Mala beach which is slightly more strenuous. In the summer, there isn’t much shade and things can get rather warm, especially around midday, so, as with any walks you do on the Riviera, bring plenty of suncream and more water than you think you need. I would advise you to cover it starting from Monaco and ending at the Mala (leaving the best till last), although it can also be done in the opposite direction. There are plenty of designer boutiques: the Cartiers, Guccis, Vuittons et al. But also Nice Antibes, Monaco, Villefranche sur mer have great shops that won’t be so hard on your wallet. Many towns have a regular brocante (flea or bric-a-brac market). This is a good way to pass the time, pick up a 1950s edition of Paris Match, some mismatched crockery, a few dusty 45’s or some locally-made jewelery. We travelled down to the Riviera for a random week and found the following: The Harley-Davidson Euro-Festival, Ste Maxime’s Fête Vôtive (Saint’s Day), the Cannes Film Festival and VE-Day commemorations. You’re pretty much guaranteed to find a festival. Roads may be closed or very busy and there will probably be some extra noise but otherwise, party away! Riviera FM on 106.5FM gives local information in English. In print media, look for the Riviera Times or Riviera Reporter for upcoming events. You can’t miss the vines, vineyards or wine sellers here: 580 winegrowers produce 160 million bottles annually. There are actually 3 ‘appellations’: Côtes de Provence, Coteaux d’Aix-en-Provence and Coteaux Varois en Provence. The region’s speciality is rosé, but red and white are well represented. Check out local supermarkets, wine shops or producers for tastings and to buy. Now please try a Nice wine : Vin de Bellet. Very few bottles every year, but could be found on many Michelin listed gourmet restaurants. Homemade ice-cream is everywhere. Many people will skip dessert at a restaurant, buy an ice-cream cone and eat it whilst strolling along the promenade. If you would like a dessert, the Dame Blanche is a sundae made with vanilla ice-cream, chocolate sauce and chantilly cream. © 2019 | My French Riviera Rental & Cote d'Azur Business Consulting - All rights reserved.